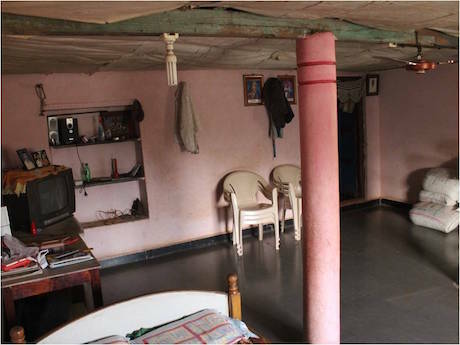 In spite of regional differences, social backgrounds and levels of prosperity, there is a certain unity in the way that homes in India look. 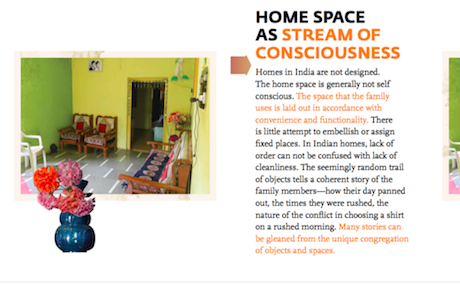 What provides ‘homely comfort – a term that is used to characterize essentially what homes should be. What makes a home quintessentially Indian? What does it say about the nature of needs, priorities and social structure? How is this reflected in the way space is used? What are the typical artifacts that unite India in symbolic terms? Homes are characterized by a sense of flow. It is a space that does not demand considered thought either by way of arrangement or in the way of being. Spaces are not super specialized by function or designated place for objects. Bedrooms may flow into the living room if grandfather likes to sleep below the window there or shirts may be perpetually draped on the back of the dining room chairs; simply because it is the first available clothes hanger like object one encounters on coming back home from work. The needs and convenience of the inhabitants reign supreme. Spaces and objects follow the flow of life within that space. Untidy trail of objects and the off hand treatment given to aesthetics however needs to be distinguished from cleanliness. Homes are meant to take care of the well being of the family and safety, security and prosperity are the key needs that it caters to. It is a space that contains and takes the family and the guests into its fold. The doorway is therefore invested with a great deal of significance as it marks the separation between home and outside ; between trust & mistrust; between safety and threat; between prosperity and want. The woman of the house, mostly a mother figure, is the one who is charged with responsibility of translating this. She is the definitely the chief custodian of homeliness. One has grown up believing that every Indian woman reflected the Mother/Caregiver archetype. Even if she started out as the Innocent or had a brief stint as the Explorer or even the Rebel, eventually she had to be the Mother. Whether it was biological or metaphorical, in real life or on screen, this was essential for the woman if she had any desire to get her man or to avoid being punished or simply bumped off. On screen, the Bollywood heroines followed this trajectory, reflecting it in the clothes that transited from fashionable to the prescriptive, gracefully draped sari. Transit accomplished, you knew that she was (as she still normally is) going to be shortly rewarded with marriage. Long-suffering was a prefix that came with the territory and all the roles. Femininity in India has been characterized as soft, gentle and comprehensively embodied in the quintessential blushing bride. She is delicate but with great strength of character and mythic strength to fight and protect. She spanned the unique Madonna – Warrior continuum. Coming from this space, the emerging archetype is particularly interesting. It has been brought alive on screen most sharply by Alia Bhatt. It is really fresh, so still easier to describe as what it is not. The emerging feminine is chirpy, talkative, ebullient and spirited but she is not Julie Andrews from Sound of Music. She can hang out with the boys, drink them under the table and then crash out at their place and wake up next morning with some shred of doubt whether the boys had the nerve to take advantage of her drunkenness. She is buddy- like but not a tomboy. She is aware of her sexuality and quite eager to explore it but not burdened by morality which has been the traditional tag along for the Indian woman. She is not a rebel and nor is there a sense of celebrating some hard won freedom. It is femininity that does not reference the masculine. There is some benchmarking against the man in terms of establishing her drinking credentials, in which she has to excel. This of course may be a reflection of the culture’s changing relationship with alcohol which has moved from being the drink of the despondent to being a symbol of partying. In that sense, it is a symbol of her shift from being a careworn dispenser of responsibility to an individual who is entitled to pleasure. However it is not a duel to establish equality or a sneering superiority. She does not mimic the masculine nor does she kick off against it. There are no statements being made and no points being proven here. It is an exciting discovery of territories that were never explored. It may be a playful act of cheating on taboos like checking out a disreputable neighbourhood or a bout of drunken dancing which transits her from the repressed to the expressive. She is free-spirited but not a wanderer. She can be materialistic and have dodgy ethical standards without being a gangster or a gangster’s moll. And if it is beginning to sound very evolved, the one on that count is easy. The reference point here is Alia Bhatt who has had some notable blonde moments. Of course the way she dealt with it was in keeping with the easy spirit of this femininity. No denial, no defense, no anger – just self-deprecating humour in form of a video titled ‘Genius of the Year.’ The air around this femininity is light and easy and sunny. It commands respect without the attendant gravitas. So, has the new feminine moved away from the traditional roles & associations? It is not as though everything is being redefined. There is vulnerability, sentimentality and a desire to engage with all the traditional roles and it is done to the best of one’s ability. There is some striving there. Falling short is met with tears but little self-flagellation. The feminine that went before her is not mocked and nor does she take it upon herself the task of defining a brand new space or reimagining every role afresh. The emergence of this new shade of femininity is marked by a sense of ease and guilelessness. It seems to be easy because it is not burdened by a destination. It is very real because it is a shift and not a transformation. Continuity is maintained with the relational identity that she has always held. The difference is that it still exists, but that it is not what defines her today. You are currently browsing the Semionaut blog archives for November, 2015.